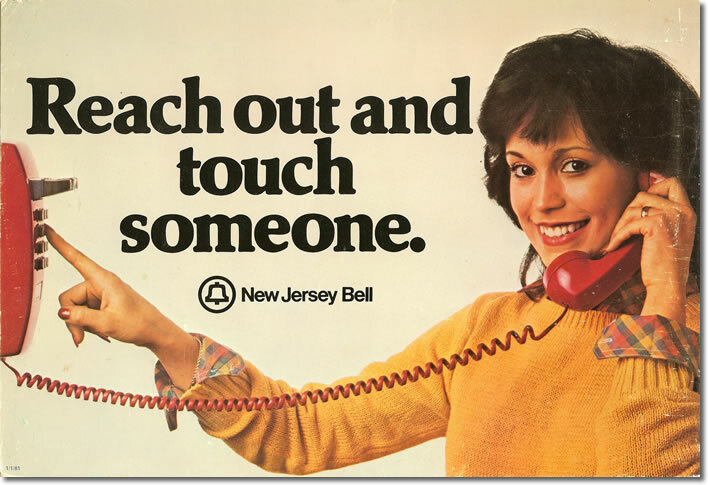 For those of us old enough to remember, this was a slogan for AT&T that was coined in 1979. It simply encouraged people to pick up the phone and call their friends and family, to reach out to those who meant the most to them. As I was driving to work this morning I was thinking about all of the great friends I have that I never get to see, or talk to, during the busy summer months. For me, working in the hospitality business is great. There is an influx of people with a myriad of personalities that make each and every day a veritable smorgasbord of entertainment. But at the end of my shift, as I ease my wearied bones into my car, the cacophonous thunder of voices that surrounds me during the day is quieted. I am soothed by the sounds of silence and the last thing I want to do is go out to a noisy bar or add to the number of hours I have acquired on the phone during the day. I lose touch with those familiar voices for a few months, but instead of wondering why my list of recent calls never displays their number, I get it. They, like me, see countless people day in and day out and, after a long day at work, want only the dulcet harmonies of nature to fall on their ears and nothing more. The madness of summer is now a distant speck through the rear-view mirror. As we forge ahead into fall, the friends that I have not seen begin to come out of their hibernation and we slowly assimilate to life as we remember it. This morning I came out of my cave, yawned and stretched and went in search of the sustenance that my friends provide. I reached out, touched someone and reconnected with those voices from my not-so-distant past. Soon the wine will be opened and those soothing voices I have longed to hear will once again infuse themselves into my reality.